This is the largest of the Pictish Protection knot series at 25mm, which is approximately the size of a quarter. Solid, bold and clean, this version is as strong as it's name implies. The knot work bail will be large enough for the stongest bigger diameter chains, and would not be appropriate on any chain under 2mm. 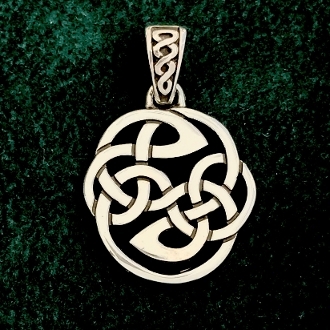 Men and Women alike will appreciate the aesthetics of this piece, and it would make a proud expression of Celtic appreciation on anyone who chooses to wear a bolder pendant style. This Ancient symbol was carved into stone by the artisians of the Pictish Tribal culture. The primary function of this pattern was to ward off unseen negative forces. This design is crafted from a single knotwork strand, and is complete and whole within itself, and thus impervious to outside influence and forces. The ancestral origin of the "Picts" lie in the Northern Highlands of Scotland, subsequently the symbolic beauty and use of the "Pictish school" of artwork was incorported into the Celtic Art styles of Ireland, Wales and beyond. Chain Recomment: Goes very well on the 2.0mm, 2.5mm or 3.5mm Round Box Chain.